Pan Fried Potatoes are simple, easy, crispy, golden bites of heaven! 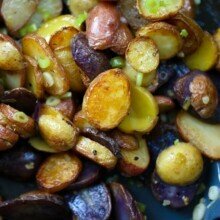 Seared in buttery goodness it's one of the best potato side dishes. 28 oz. tri-colored baby potatoes about 1 1/2 lbs. Wash potatoes and dry gently in kitchen towel. Slice each potato into 1/3-inch rounds. Heat a large nonstick skillet* over medium high heat. Add in butter and olive oil and stir together to melt and sizzle. Add in potatoes and stir to coat each potato in the butter-oil mixture. Sprinkle salt and pepper overtop and stir again. Reduce heat to medium and let potatoes cook 5 minutes before stirring and flipping. Cook another 5 minutes, then flip again. Continue the cook-5-minutes-then-flip pattern for 30 minutes or until potatoes are brown and crispy on the outside and tender on the inside. For the last 5 minutes of cooking, add in scallions. Taste and adjust the salt as necessary. *If you're NOT using nonstick, you will have to flip your potatoes every 2-3 minutes.